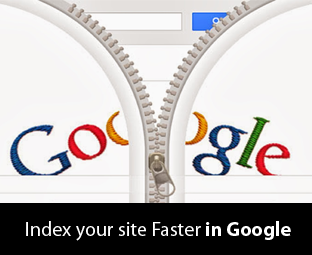 Why Google Indexes new websites slowly? Less Authority: When you create a new site, it has almost ZERO authority while other old sites have better authority this is the reason why your site takes a while in indexing. The older your site would be, the more authority it would gain so it’s just a matter of getting your site a bit older. Less Content: Google loves content, not just content, but fresh and quality content. New sites have less or no content, this makes almost impossible for search engines to get a blank page index (in some cases Google even indexes blank pages). However, write content that has quality and quantity at the same time. Lack of Social Signals: Now days, search engines do count on social signals (the no of shares, tweets, likes the content is received from social networking websites) and on the basis of that they index or rank websites. For a new site, it is almost impossible to overnight get a lot of social followers. Under the Scan: For those who don’t know, Google always takes a nice look at your site before it is indexed in the search engines so if there is any delay in indexation then your site is under the scan..
To find the number of pages indexed go to Google.com and search for site:mybloggerlab.com (Note: Do not forget to replace mybloggerlab.com with your website address). If you see no results, then you should implement the tips we have discussed in this article. Following screenshot shows the search results for the above query. The techniques which we’ll be discussing in this article are applicable for both new and old websites. In short, we will be using some external websites to send search engine crawlers to our sites, forcing them to index our site faster than usual. What is a sitemap? A sitemap is the list of posts or pages that you’ve published on your site which helps search engine crawlers to index your posts according to the its published dates. By submitting a sitemap to Google, Yahoo, Bing, AOL and etc. you’re inviting them to index your blog faster and efficiently. If you haven't submit your sitemap to Google then do it today by going to the webmaster tool. After publishing a new article, comment on authority high traffic blogs. This not only provides some traffic, but at the same time search engine crawlers will follow your site if the attribution is set to Dofollow. This is an old but working technique that every newbie blogger implements and if you haven’t then try it from today. You will start seeing the changes within a week or so depends on how much blogs you’re commenting on daily basis, I would prefer 20 to 30 comments a day. This is another method which is very effective for new blog owners. Facebook or even Google+ has active groups and communities that allows you to share your posts URLS on them. When you’re sharing those URLs on those groups, you are actually sending a social signal to your site. This means the more you share, the more social signals it will send back to your site. 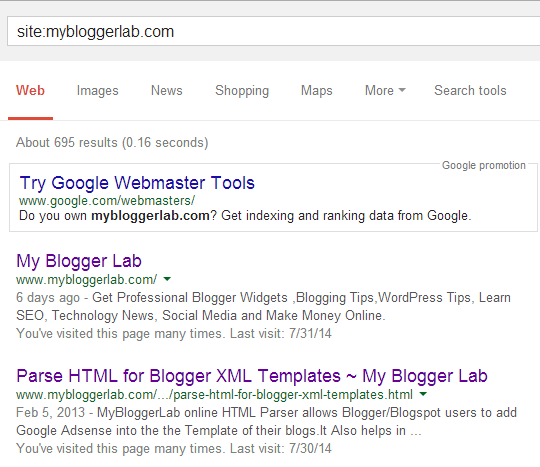 We have also implemented the same technique in the early days of MyBloggerLab.com and results were pretty much amazing. Ping service is another working way to alarm search engines to index your newly published posts. However, Blogger as well as WordPress automatically sends pings to search engines, but doing it efficiently by doing it yourself won’t hurt much. People say Guest posting is no longer effective, but the reality is they have the same significance at the moment as well. If you have time write 5 to 10 quality articles and ask high authority blogs to publish them and provide a Dofollow link to you. Try to guest posts on blogs that are related to your niche, are updated regularly and consists of the active audience. By doing this, you will get some healthy traffic and again in your authority. Just to prove this thing really works, I applied these techniques on one of my new testing blog and results were pretty pleasing. 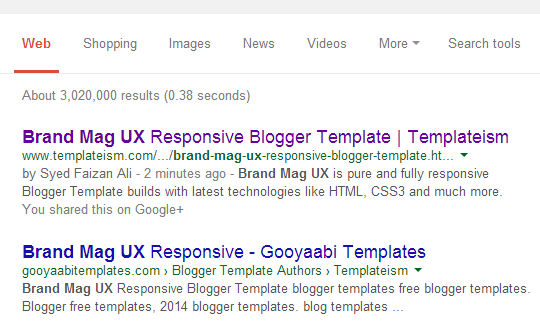 The following screenshot shows a website that was indexed in Google within 10 minutes. We hope this article has helped you in learning some of the unrevealed secrets of getting your site indexed faster in Google search engine. Now, since you know they go ahead and apply them for results that you’re looking for a lot of months or even years. Does share your experience with us, after applying these tips by commenting your opinions below. 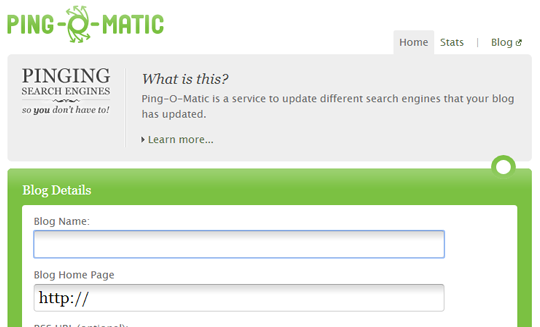 Ping is a great way of letting search engine know that you want them to check your site and update the search results.